VA created VetChange to help Veterans monitor their drinking and take control. VetChange is a free, confidential online program to help Veterans cut back or stop drinking, and learn to manage PTSD symptoms without using alcohol. Based on scientific research, VetChange helps you build skills to better manage your drinking and other problems Veterans can experience after deployment, including symptoms of PTSD. Set your own goals. Learn at your own pace. Check your own progress over time and adjust your personal plan for change — with VetChange, you’re in the driver’s seat. Monica Roy, who is the Program Manager for Substance Substance Abuse Residential Rehabilitation Treatment Program and Outpatient Alcohol and Drug Treatment Program at VA Boston Healthcare System’s Jamaica Plain Campus. She served as a subject matter expert for the development of the VetChange App. 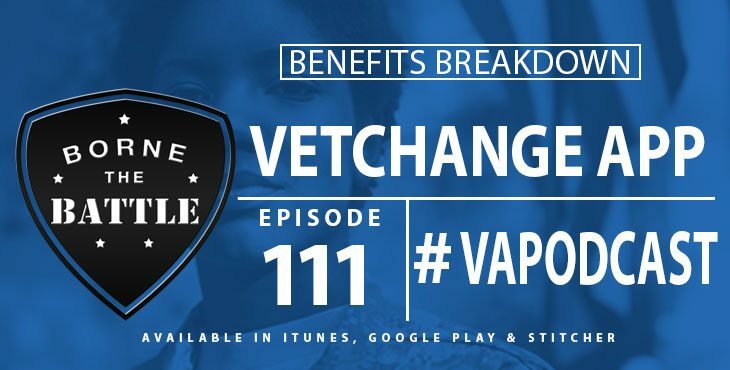 She joins us on this episode to explain how VetChange came to be and how it benefits Veterans. I am having trouble maintaining my treatment in the mental health area. Given the choice program to see a therapist after two approval periods, it was suddenly stopped. Someone said it needed more review. I did not hear anything back and one month later I still need to see this therapist. You can’t just pull mental health care away from someone so quickly. And I should have received official comments on why and what I need to do. I learned about it by calling and calling – always getting no answer. I have been waiting for over a month for a visit to a psychologist after seeing a psychiatrist. First of all the Doctor appointment was originally made for Aug 20th. I went in early because I made a mistake reading the app form…They were nice enough to see me. That doctor said she knew nothing about the choice program and did not refer me to the psychologist right in the same building. Instead she wrote for a referral to a bigger clinic in Austin about 25 miles away. Again the wait is way over 30 days….August 8th. I plan on going and asking about the choice program and getting back on it. I am a vet and I have been with the VA for many years. Many times now I use Medicare to save room for seriously ill vets getting an appointment. Please figure this out for me and let me know there is some organization to this care or the lack of it. I go to the VA in Cedar Park and my next appointment is at the Austin VA clinic. Ok the new bill on Medical treatment has been signed so how long before vets can go to of the private facilities and get treatment. Especially prostrate cancer and robotics.